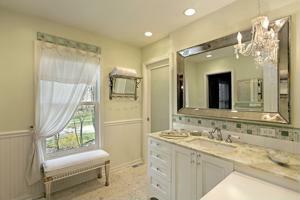 Are you in the process of a bathroom renovation but can't seem to make up your mind about how it's going to look? Why not go the luxurious route and create a space that's fit for royalty? Everyone wants to feel like royalty once in a while, and there's no better place to feel like a king or queen than in a bathroom. Starting with the fixtures, opt for super luxurious features in the space, like a whirlpool or a bathtub for a truly opulent soaking experience. For the bathroom vanity, a piece with wood cabinets that have ornate detailing and a marble countertop screams sophistication. You can even add some form of seating, like a stool or lounge chair, in the space because there's nothing better than sitting on a comfortable chair while waiting for the tub to fill. For decors, look for functional but still beautiful bathroom accessories to place in the room. When it comes to lighting, go big by installing a chandelier to elevate the overall royal look of your bathroom.